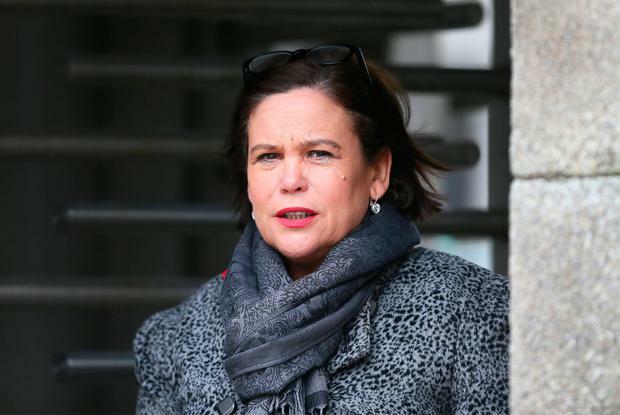 Sinn Fein leader Mary Lou McDonald has attacked the two main parties for ruling her out as a future Tanaiste. In her first Ard Fheis speech as president of Sinn Fein, Ms McDonald said Fine Gael and Fianna Fáil will have to talk to her about forming a coalition after the next election. She said the parties’ leaderships need “to wake up and smell the coffee”. “Our democratic mandate and more importantly the people who vote for Sinn Féin will be respected. “It is not for Leo Varadkar or Micheál Martin to decide whether or not we enter government,” she said. On Brexit, Ms McDonald said the UK Conservative Party can no longer be allowed “to dodge, equivocate and engage in fantasy non-solutions to the Irish question”. She said the EU Summit at the end of this month is “crunch time”. “If they cannot demonstrate how they will avoid a hard border, protect the Good Friday Agreement and citizens’ rights then the Irish government must call them out. “There can be no question of progressing to the next phase of these negotiations in the absence of an answer to the Irish question,” the Dublin Central TD said. Having been criticised for using the republican phrase ‘tiocfaidh ar la’ in her inaugural speech as leader, Ms McDonald attempted to be more diplomatic this time. “A new Ireland must be home for Unionists. We need to understand that. We need to find ways to talk about the future,” she said. She said it isn’t easy to reconcile the past because “people suffered, were hurt, endured pain, inflicted pain”. Ahead of her speech in Belfast the party rowed back on a threatened motion of no confidence in Housing Minister Eoghan Murphy. But she told delegates last night that he is not fit for office. “Eoghan Murphy has failed dismally to turn the tide because he is simply the latest proponent of disastrous Fine Gael policy. “Let’s be clear – the housing emergency is a whole of government issue. The buck stops with Leo Varadkar,” she said Ms McDonald said the Government had failed to house citizens or tackle the rental crisis. “A government with Sinn Féin would take the responsibility Mr Varadkar refuses to take,” she said. “Sinn Féin will deliver a budget for those who struggle to make ends meet despite getting up early and working hard every day. Earlier at the Ard Fheis, Sinn Fein members voted to amend its policy so that TDs can support legislation allowing for abortion up to 12 weeks. Despite campaigning for repeal of the Eighth Amendment, the party was not in a position to vote for the new regime being proposed by the Government. The party leadership will now be allowed to set policy on the issue “informed by the best available medical advice”. The motion said Sinn Féin supports the Joint Oireachtas Committee findings on abortion and reasserts that abortion should be available where a woman’s life, health or mental health is at risk and in cases of fatal foetal abnormality. A second motion calling for a TDs to have a free vote like Fine Gael and Fianna Fáil was heavily rejected. In her speech, Ms McDonald said the delegates had made the right decision and the party is now “united in our determination to see the necessary legislation passed without delay”.